Choosing the right workstation is a smart investment. Many engineers, designers, researchers, financial analysts, and other highly trained professionals depend on their workstations more than any other single tool to support their creative ...efforts. A sufficiently powerful system is essential to get the most out of their abilities, and to avoid the difficulties that can result when a workstation cannot keep up with its workload, introducing delays that can stall and even derail the creative process. Intel® processor-based workstations are the most widely deployed 64-bit workstation platforms in the world. You can count on them to deliver the performance, stability, and reliability you need to move forward with confidence. They come in a wide variety of configurations. Whether you need near-supercomputing performance on the desktop for digital prototyping, a mobile workstation for customer collaboration and designing on the go, or an entry-level workstation for office power-users, this guide can help you choose the right system for the job to maximize your creativity and innovation. Typical office workers running standard office applications will get all the performance they need from a standard business PC. Anyone running more demanding applications can expect to be more productive, creative, and satisfied using a workstation. The additional cost for an entry-level system is small and the performance gains can be stunning. A true workstation will offer dramatic gains across each of the parameters listed below. 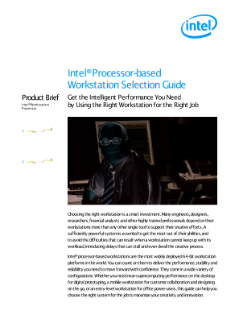 Read the full Intel® Processor-based Workstation Selection Guide. Stockholm University Professor Erik Lindahl discusses how RELION helps optimize Cryo-EM* protein models.